Transportation Secretary Anthony Foxx was in Los Angeles this week to commemorate the announcement of $1.6 billion in federal funding toward the extension of the Los Angeles Metropolitan Transportation Authority’s (LAMTA) Purple Line subway route. 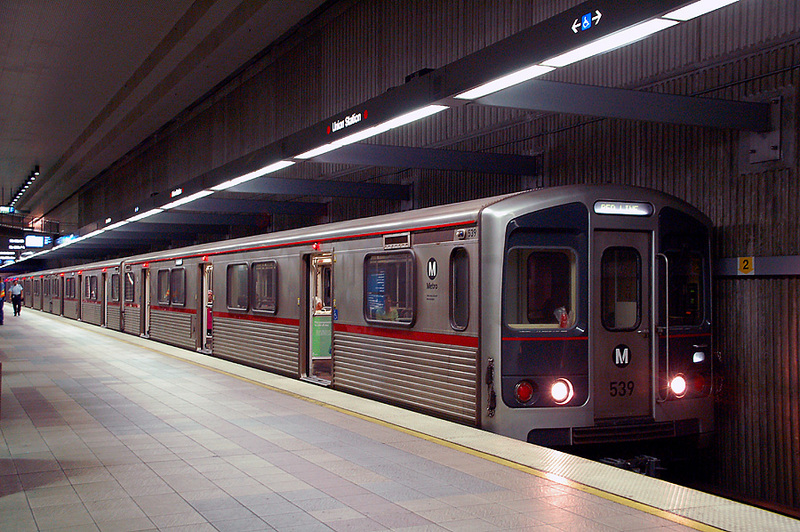 The existing Purple Line opened in 1993 and begins in Downtown Los Angeles’s Union Station, sharing track with the system’s Red Line along most of its length. The route separates from the Red Line in the MacArthur Park neighborhood and currently terminates as a two-stop spur along the city’s Wilshire Boulevard corridor. Eventually, the Purple Line is expected to reach the oceanside community of Santa Monica and is being built in a piecemeal effort to achieve that goal. 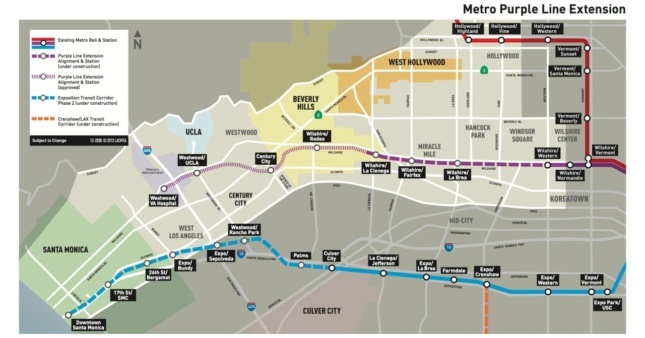 The first, 3.9-mile long extension from the current terminus at Wilshire Boulevard and Western Avenue to La Cienega Boulevard is currently under construction and is expected to open for service in 2023. The second phase of expansion will run from La Cienega Boulevard to Century City, roughly two-thirds of the way between Downtown Los Angeles and Santa Monica. The new round of funding announced by Foxx includes a $1.187 Federal Transit Administration Capital Investment Grant, a $307 million Transportation Infrastructure Finance and Innovation Act loan, and a $169 million grant from the federal Congestion Mitigation and Air Quality program. The remaining $747 million in funding for the $2.41 billion expansion will come from Measure R funds, a voter-approved transportation sales tax increase passed in 2008. Construction on the phase two extension is expected to begin in 2018 and will be completed by 2026. There is a possibility that construction on the extension could be sped up so the line would be operational for the 2024 Olympic games, should the city be selected as that year’s host. Phase three of the extension will move the end of the line 2.6-miles further west to the upscale Westwood neighborhood and the nearby Veterans Administration Hospital (VA) complex. Plans for extensions beyond the VA campus have not been announced. The current round of funding was bolstered by the passage of Measure M this November, which entails an additional county-wide tax increase to fund transportation infrastructure projects across the region in perpetuity. According to government officials, the guarantee of these future funds compelled the Transportation department to move forward with the latest round of grants and loans. The new transit line has the potential to reshape the city’s Westside neighborhoods and could usher in a new era of dense, transit-oriented development along Wilshire Boulevard. Anticipation for the future line is building, as a similar transformation has already begun to occur along the system’s recently-opened Expo Line that runs several miles to the south along a parallel trajectory. Already, several high-rise housing projects have been announced along the eastern portions of the Wilshire corridor, including a 15-story residential luxury tower designed by Steinberg Architects in the Mid-Wilshire area and a Pei Cobb Freed & Partners-designed addition to Minoru Yamasaki’s Century Plaza Hotel in Century City.